Chequered Flag special edition is available with a range of Ingenium four cylinder engines from the 132kW diesel through to the 184kW and 221kW petrol engines. Australian 20MY XF prices start from $81 700 + ORCs for the Jaguar XF Saloon Prestige 20t. 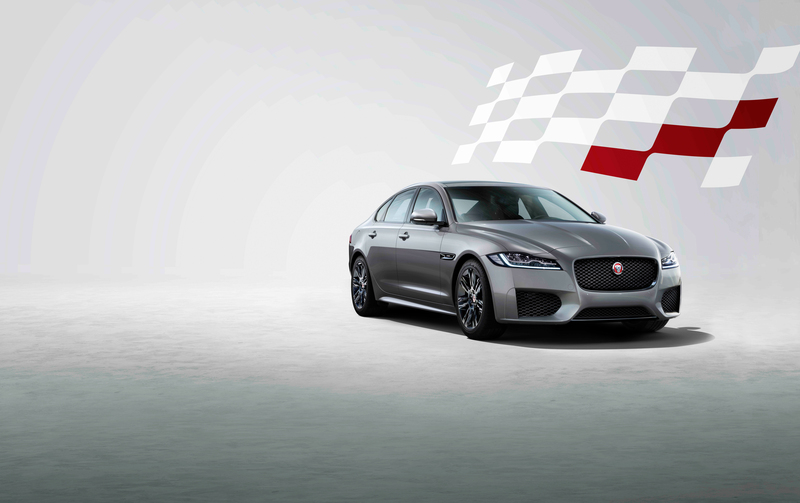 01 February 2019, Whitley, UK - Jaguar has revealed new Chequered Flag special editions as part of the latest model year updates to the XF Saloon and XF Sportbrake. The Chequered Flag editions feature a selection of unique exterior enhancements, handpicked interior design elements and a choice of Jaguar's efficient and powerful British-built Ingenium diesel and petrol engines. Ian Callum, Jaguar Director of Design, said: "The XF Saloon and Sportbrake combine the elegance and exceptional performance which underline all Jaguars. Both XF models feature beautiful silhouettes giving them a dynamic appearance perfectly suited to the Chequered Flag badge." A selection of the most popular optional features fitted to the XF are also standard on the special edition. Navigation Pro with InControl Connect Pro incudes a Live Traffic function which helps drivers avoid traffic jams for a more seamless journey, while it also allows users to share routes from a computer or mobile app. Further features include the 12.3-inch Interactive Driver Display and keyless entry. As part of this model year update, a new Smartphone pack which features Apple CarPlayâ and Android Autoä is standard on all models. The technology mirrors the user's smartphone allowing them to access a selection of apps on the car's 10-inch Touchscreen. The Chequered Flag models are available with a choice of Jaguar's powerful and efficient petrol and diesel engines. A fast sweeping silhouette is formed around Jaguar's aluminium-intensive architecture and combines the outstanding proportions, elegant surfaces and perfect lines which define all Jaguar cars. The Jaguar XF's lightweight construction and optimised driving dynamics deliver the ideal balance between ride and handling. All-Surface Progress Control enables smooth, effortless traction on low-grip surfaces. The cabin is a seamless blend of contemporary luxury materials and finishes, traditional Jaguar craftsmanship and intuitive technology, with features such as a reconfigurable 12.3-inch Interactive Driver Display, laser Head-up Display and the Touch Pro infotainment system. Jaguar's heritage of elegant design and breathtaking performance has excited and delighted the world for 80 years. Today's world-class Jaguar family embodies the Art of Performance, with the remarkable, much admired and award-winning XE, XF and XJ saloons, the dramatic F-TYPE sports car, the F-PACE performance crossover – the fastest-selling Jaguar ever, the new E-PACE compact performance SUV and now I-PACE, the all-electric performance SUV that puts Jaguar at the forefront of the electric vehicle revolution. The Chequered Flag special edition was first introduced on the F-TYPE to celebrate Jaguar's sports car lineage that spans 70 years, beginning with the XK120. 20MY Jaguar XF Chequered Flag.